Fall is here which means that the holiday season is just around the corner. You know what that means – it’s time to start crafting for Christmas! I know, I know, it seems a little early. 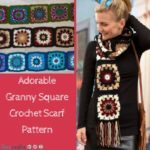 But if you plan to crochet, knit or quilt your own DIY projects this season, you have to get started sooner rather than later. 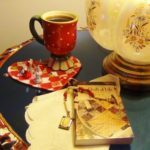 Luckily, we have a free eBook, 11 Christmas Gift Ideas: Handmade Scarves, Hats and More to keep you busy until Christmas morning. This eBook includes a variety of projects for everyone! Kids will love making paper Santa hats and adults can make their own knit and crochet wearables. Bring Santa and his elves to life through your own handmade Christmas projects. You can even more a necklace that’s covered in ornaments. Each wearable makes a great gift for someone on your list (and you can always keep one for yourself, we won’t tell). Don’t stress about finding the perfect Christmas gift for your loved ones. Instead, make a few versatile wearables that you know the person can use. Is there anything worse that receiving a gift and having no clue what to do with it? Make a scarf, hat or necklace for your next gift exchange – your craftiness is sure to inspire confidence. 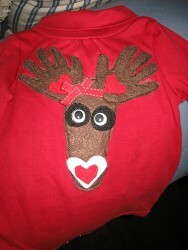 Foot and Hands Reindeer Shirt: Want to impress your kids on Christmas morning? Have them participate in the creation of their own Christmas present. Save a plain shirt and use it as your canvas for the project. Trace your child’s hand and footprints on on pieces of scrap fabrics. Use a fabric fuser for this craft and then either hand-stitch or sew the piece onto the shirt. Save the shirt until Christmas morning and have your little one wear it to celebrate the day. 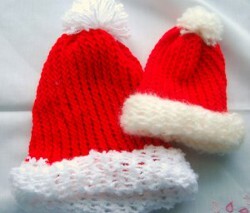 Loom Knitted Santa Hats: Don’t let the name of this project scare you. It’s so easy to make your own Santa hat using a loom. In fact, you can make a baby hat in less than two hours. If you want to make a hat for an adult, simply use a bigger loom. This is a great alternative to traditional knitting and so much fun. 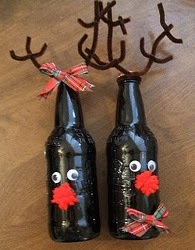 Step outside the box and try something new for this traditional Christmas craft. Make a Santa hat for everyone on your list – it’ll get them in the Christmas spirit and keep them warm at the same time. 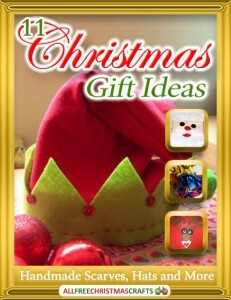 Download a copy of 11 Christmas Gift Ideas: Handmade Scarves, Hats and More – it’s totally free! Get creative with your Christmas gifts this year by making your very own soap! You can use a fragrance of your choice, too. Try making some with the Christmas spirit, like peppermint or cinnamon, and make some of your Christmas Curl Soaps with a more year-round scent, such as lavender or vanilla. 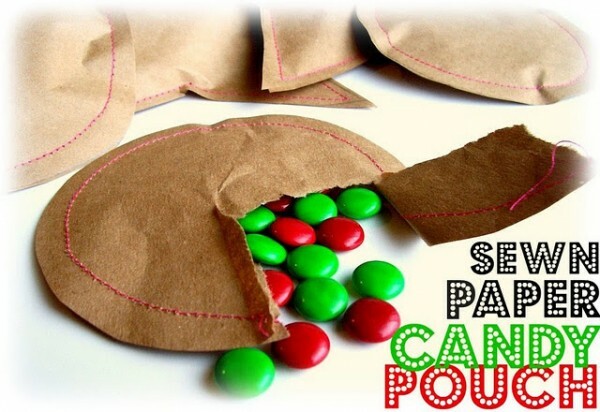 These are super fun Christmas gifts to make, too! You might want to make this one without little kids around, but if your kids are old enough to help with this craft, it can be a really fun, family-friendly activity! Your kids can learn all about how soap works and what it is really made of, too. 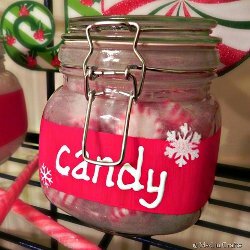 After making these Christmas gifts, your house will simply smell incredible! Plus, your friends and family will definitely enjoy their Christmas gifts from you this year. Make sure to decorate your soaps with ribbon and other embellishments so they will sparkle and shine! I have news for you – there are officially on 5 months until Christmas! I bet you’ve noticed a few Christmas items at local big box stores or spied a few Christmas in July posts on your favorite sites (including this one). Before you know it, the weather will begin to change, the kids will be hopping on the bus back to school and the holidays will be upon us. Sure, there are some important dates in between now and Christmas (Halloween, Thanksgiving), but nothing requires quite as much time, dedication and planning as the holiday season. Save yourself the stress and start creating homemade Christmas gifts now. 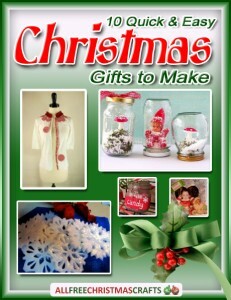 The latest eBook from AllFreeChristmasCrafts, 10 Quick and Easy Christmas Gifts To Make, is filled with crafty inspiration. Gift giving is one of the most rewarding aspects of Christmas, but the need to find the “perfect gift” can lead to undue stress. 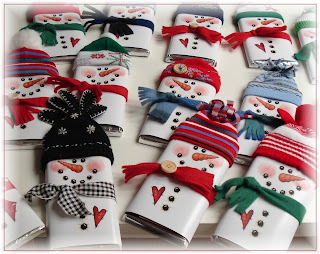 Download a copy of 10 Quick and Easy Christmas Gifts to Make (it’s free!) and save it all year long. You can come back to this eBook whenever you need an unexpected and unique gift idea. 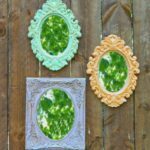 Many of the crafts are kid-friendly and simple enough for beginners, so crafter of all ages are sure to find a fun gift to make. Add a personal touch to a practical item this Christmas – it’s so simple! Using etching cream and contact paper, transfer a homemade image or word on to an everyday item such as the casserole dish featured above. Each time they make a delicious dish, the gift recipient will be reminded that you created a thoughtful gift just for him or her! This is a great gift for a cooking enthusiast and it’s so simple to make. 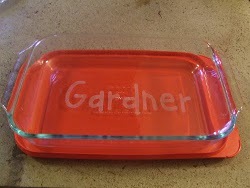 In fact, you can create a Personalized Casserole Dish in less than hour. 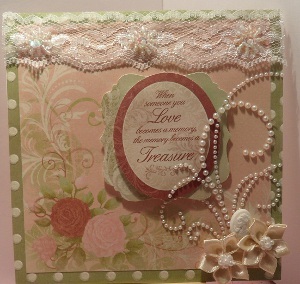 This is a fantastic project for a novice crafter or anyone that is short on time. Cold winter morning require a warm beverage, it’s pretty much the law. You probably don’t realize just how harmful those little paper sleeves are for the environment. 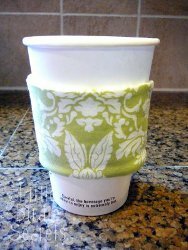 If you have a special someone on your list that can’t survive without their morning cup of coffee of tea, make a Coffee Cup Cozy using fabric scraps and a sewing machine. This is a simple project for anyone that’s new to the world of sewing. Plus, you can use up your fabric scraps and save yourself some cash. Last winter, Taylor Swift sent out a Twitpic that rocked the craft universe. Why? Because in the photo, she was making her own snow globes! Immediately, it seemed that everyone was looking for snow globe projects and tutorials. 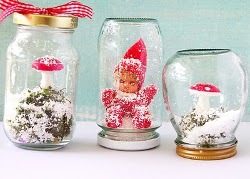 Snow globes are a fun collectable that can be displayed anywhere. Best of all, you can use recycled mason jars for this super simple project. 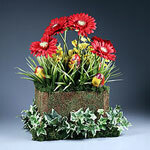 Each globe can be personalized using figurines, fake foliage and more. Search your local dollar store for cheap plastic miniatures and add them to your project. This gift is ideal for someone who works at a desk – he or she can think of you every time they glance at their personalized snow globe! 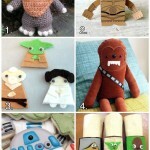 These are just a few of the projects featured in 10 Quick and Easy Christmas Gifts to Make. Download a copy today – it’s free! At AllFreeChristmasCrafts, we want you to stay in the Christmas spirit all year long. Christmas isn’t just a day or even a season – it’s a state of mind! That’s why, twice a week, we are dedicated to providing readers with the best Christmas craft projects and tutorials from across the web. Want to get in on the fun? Subscribe to our newsletter, Crafty Christmas Ideas! Over the past month, we presented our Christmas Gift-stravaganza, which featured DIY ideas for mom, dad, friends and kids. Every Saturday, we featured one group of gift recipients and presented our favorite gift ideas. We also provided plenty of tips to keep in mind when making gifts – mom appreciated handmade items from the heart while dad is more concerned with comfort. Kids want gifts they can actually use while friends love a quality keepsake. 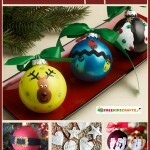 You can also find all of these collections in the DIY Christmas Gifts section of AllFreeChristmasCrafts. Just because you missed our gift series doesn’t mean you’re out of luck. Subscribe to Crafty Christmas Ideas and have great Christmas craft tutorials and gift ideas sent straight to your inbox twice a week. By December 25th, you’ll be prepared and ready to celebrate! There’s no better way to show your love and appreciation for someone than to make them something by hand. Whether it’s baking cookies or knitting a scarf, a handmade gift can go a long way. 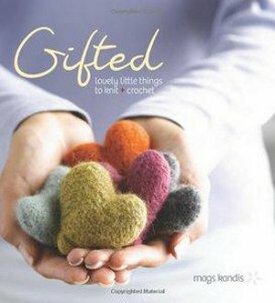 In her sweet book, Gifted: Lovely Little Things to Knit and Crochet, author Mags Kandis provides tons of ideas for handmade gifts for all occasions. From holidays to birthdays, thank you gifts to crafts to make for someone who is ill, this colorful book has it all. 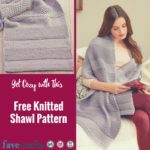 We at FaveCrafts loved Gifted so much that we want to “gift it” on to you! In this book you’ll find everything from wearable accessories to home decor. 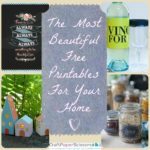 There’s ideas for people who love to knit, people who are hooked on crochet, and even a few projects for those who love to sew, bake, or felt. 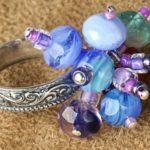 This is the ultimate gift giving guide for those who enjoy handmade treasures. Personally, I love making things for people…but sometimes I’m just at a loss as to what to make. My brother is near impossible to shop for, and my sister likes too many things to narrow it down to a few ideas! That’s why I love Gifted. Even if I don’t make one of the 34 projects included in this book, I can use Gifted as inspiration for thinking of new gift ideas. This is one book that you will find yourself coming back to again and again. So be sure to check out the Gifted giveaway page and enter to win this great book! You can enter once daily, so come back often to increase your chances of winning!